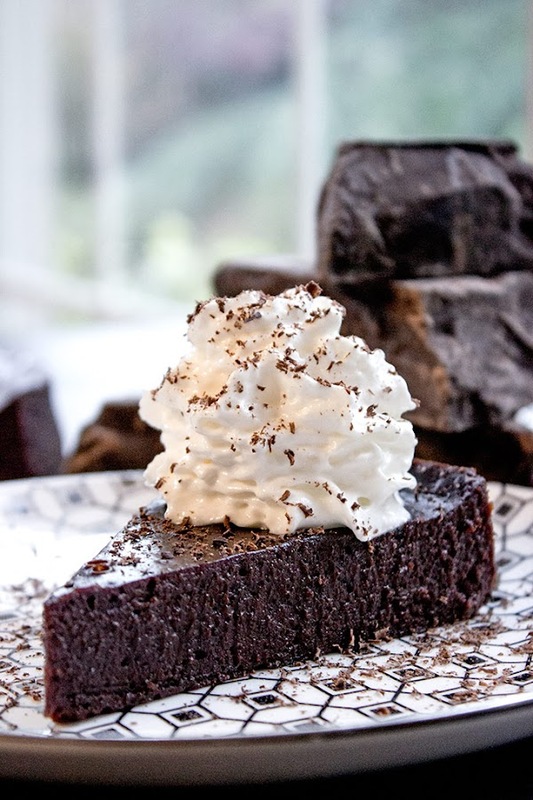 Flourless Chocolate Cake with just 4 ingredients and 5 minutes of prep time. Perfect for Passover, Easter or anytime you want the richest, easiest cake. Add the chocolate and butter to a microwave safe bowl. Microwave for 30 seconds, in three intervals (wait a minute or so before each one) but don't mix. Let sit for one minute, then stir the butter and chocolate until smooth. In a larger second bowl, mix the eggs and sugar with a whisk. Make sure the chocolate is not too hot or wait another minute or two. Whisk in the chocolate into the egg mixture slowly until fully combined. Sit your springform pan on top of a sheet of foil and press it up against the sides so there is a barrier between the pan and the water. Add the batter, cover the top with foil and put it in your pan with water. Bake in a water bath for 75 minutes. Remove from oven and from water bath. Uncover and let cool completely.